As a mom, newborn portraits were high on my priority list. Preserving memories is important to me. When my youngest son was born, I had a really hard time finding a photographer who offered both lifestyle newborn sessions, and posed newborns. I have made it my mission to be a that newborn photographer! My newborn sessions are packaged separately, but are actually designed to be paired together! I currently offer Fresh 48s, Lifestyle, and Studio newborn packages. I’m excited to introduce take you behind the scenes a bit today! My studio newborn sessions are simple sessions for those adorable newborn poses that everyone loves! This session can be for your newborn alone or you may also choose to bring siblings along! However, my studio is a small space. I encourage you to use a lifestyle session for your family portraits. If you book a lifestyle session, or live farther than you’d like to drive, I can pack up my studio and set up in your home! I’m all about doing what is best for your family! Most of my sessions will start here! When you arrive, you will walk into a room set up for props and ready to go! The heat will be roaring and my shusher will be up loud. It’s an environment your baby will love! I typically set up 2-3 prop for each session. Before your session, I send a questionnaire to guide my styling choices. I want the colors we choose here to match your home and nursery. 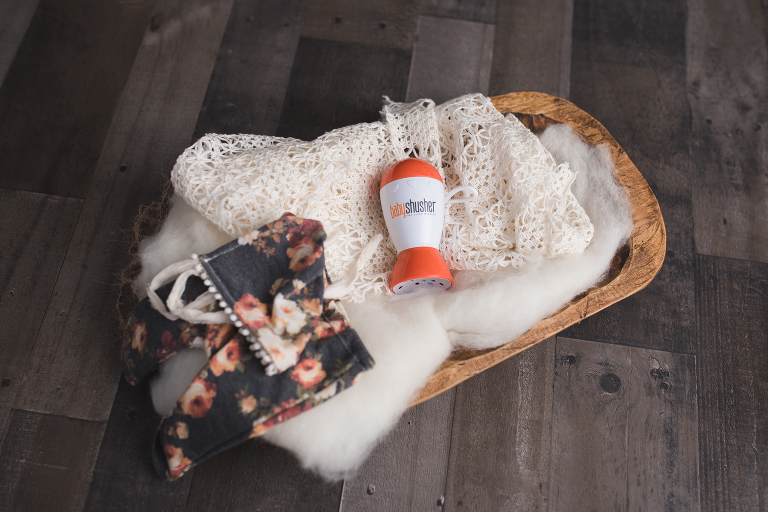 The baby shusher is a must have for every session! I turn it up nice and loud and the babies love it! I haven’t been keeping track, but I would bet that about 75% of my parents have either ordered or downloaded the app by the time they leave their session! It makes me giggle every time a new parent buys one! It’s magical for getting a new baby to sleep! Every photographer has their favorites pieces of a session. The bean bag is my favorite. This is where we get the potato sack, froggy, and naked baby poses. I love the versatility of the beanbag and the various looks we can achieve! This pose, called the potato sack, is usually the first one we try! It’s an easy one that almost all of my newborns love! A cozy wrap is their happy place! 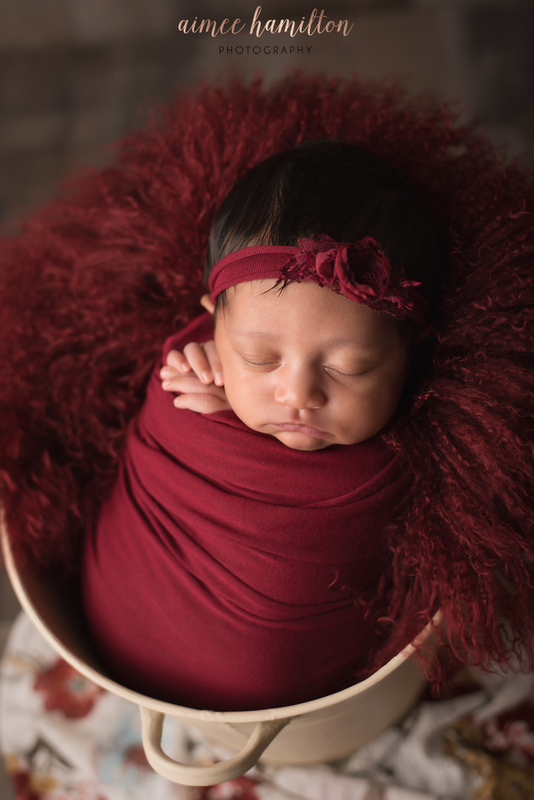 Studio newborn sessions are most successful between 6 and 13 days of age. I encourage all parents to book your session well in advance to guarantee yourself a spot on my calendar. When your baby arrives, we will schedule an official date. 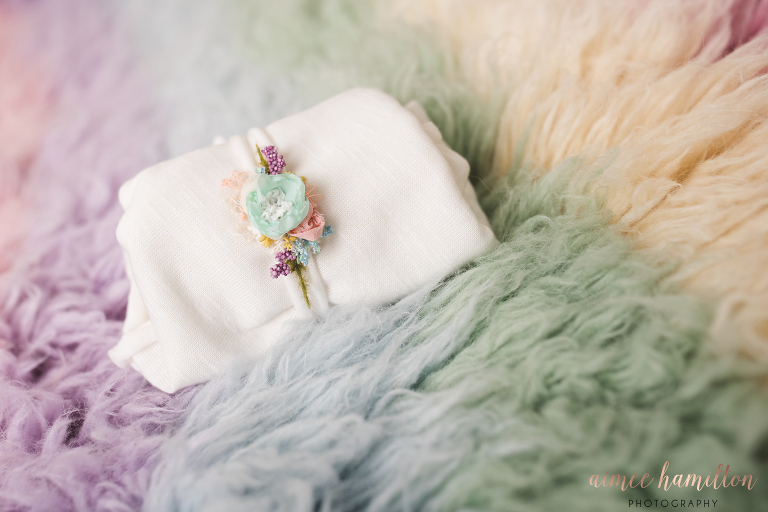 Take a sneak peek at my newborn packages here! For more details, or to book your session, contact me here! I am currently scheduling April- July newborns! 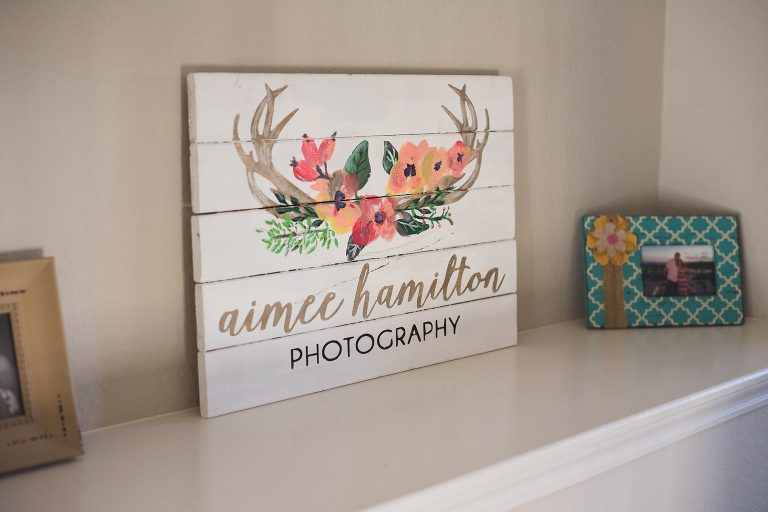 Aimee Hamilton is a Houston area newborn photographer serving Montgomery, The Woodlands, Magnolia, Conroe, Tomball, Spring, and Cypress.